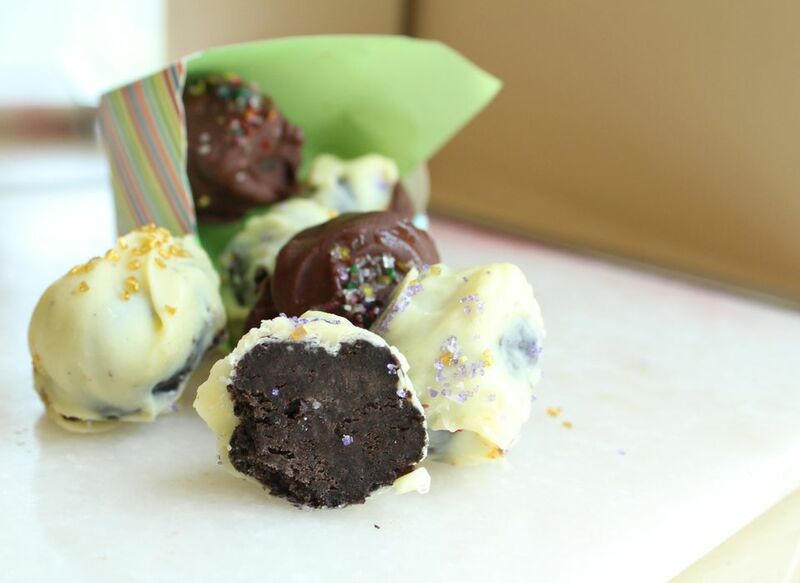 So, you might be dubious of how delicious these chocolate dipped Oreo truffles may be. You may even be thinking "the whole point in buying Oreos is so that I don't have to go through the trouble of preparing treats." But we're here to share how amazing these no-bake truffles are and why you should have them at your next event. Place the cookies in a gallon zip-top bag and seal, squeezing out any air. Use a rolling pin to crush the cookies into crumb-sized pieces. Transfer the cookies to a large bowl. Use a spatula to scrape any cream filling remaining in the bag into the bowl. With clean hands or an electric mixer, mix the crushed cookies and cream cheese until the mixture is well blended. Cover the bowl and place in the freezer for at least one hour. Line a rimmed baking sheet with parchment paper. Place the chocolate and butter in a double boiler, or in a heat safe bowl set over a saucepan of gently simmering water. Stir until the chocolate and butter melt together. Alternatively, you can melt the chocolate and butter in the microwave. Remove the cookie mixture from the freezer. With clean, dry hands, break off small pieces of the mixture and roll into one-inch balls. Drop a cookie ball into the melted chocolate, and use a spoon to roll it in the chocolate until coated. Transfer to the prepared baking sheet to harden, and repeat with the remaining cookie balls. If desired decorate with sanding sugar, sprinkles, or a contrasting flavor of melted chocolate before the chocolate coating hardens. After the chocolate hardens, store the truffles in an airtight container in the refrigerator for 4 to 5 days, or in the freezer for up to 2 months. Need a gluten-free version of these Oreo Truffles? Substitute your favorite brand of gluten-free chocolate sandwich cookies in place of the Oreos. I tested the recipe with Trader Joe's gluten-free Joe Joe's cookies, and they came out well. Since package weights can vary a bit from brand to brand, it's fine to count cookies. For the best flavor, look for real white chocolate -the label should list cocoa butter, not vegetable fat or hydrogenated vegetable oil. Want to turn these into cake pops? Insert a lollipop stick into each cookie ball before dipping into the melted chocolate. If you're making these truffles in advance and storing them in the freezer, be aware that they may sweat a little when they defrost.